Box of 4 pc Bussmann 25A 125V Edison Screw Base Plug fuses. Use with box cover units to provide protection for small horse power motors in heating and cooling equipment. 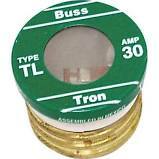 Box of 4 pc Bussmann 30A 125V Edison Screw Base Plug fuses. Use with box cover units to provide protection for small horse power motors in heating and cooling equipment.